This will be my last post for this blog. There are two components to this decision, the reason behind it and the timing. The reason behind it has been growing for a while now, and a most welcome event has provided me with the timing. But it’s not easy to let go. I lived for thirty-six years in Port Indian, a small community along (and, frequently, in) the lower Schuylkill River, just upriver from Norristown, in Southeastern Pennsylvania. During my decades there, I grew to love the Schuylkill Valley, and most of all the history of its small towns. Applying my professional training to my personal environment, I undertook studies of the towns along the lower part of the river. 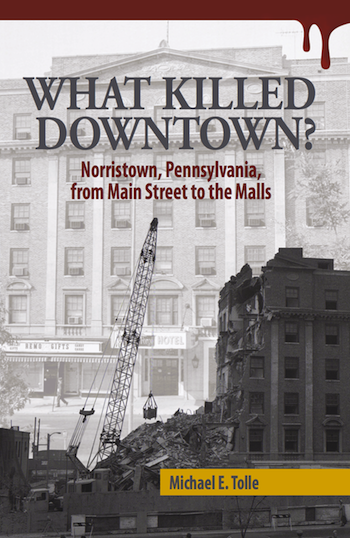 My first book, What Killed Downtown? Norristown, Pennsylvania, From Main Street to the Malls, focused on the Schuylkill Valley’s largest municipality. What Killed Downtown? related the collapse of its Main Street commercial sector after 1950, and disproved the conventional wisdom that the King of Prussia Mall was the cause. 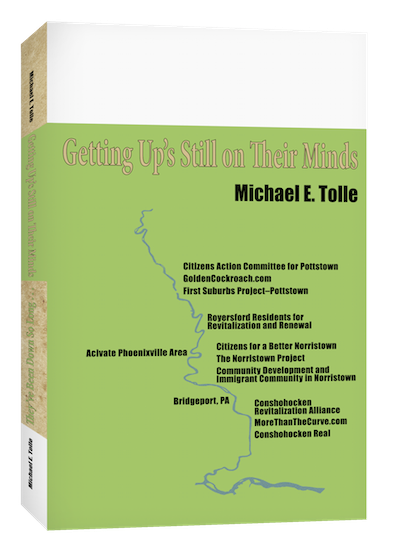 I took a very different approach for my second book, and considered the past, present and future of the eight towns on the lower Schuylkill River as a group. They’ve Been Down So Long…Getting Up’s Still On Their Minds reveals both the commonalities and the differences in their history, and the reasons for their vastly different conditions today. Both are available, by the way, at the Historical Society of Montgomery County, Pennsylvania, and, of course, on Amazon. Ironically, I did not begin this blog until my big move West. I followed my wife to San Francisco, where she had been offered her dream job in her favorite city. Once on the West Coast, I began this blog to keep my connection with the Schuylkill Valley alive, and have posted at least once a month since then. I attempted to put urban history in the service of urban revival. I believe that physical distance gave me the perspective to establish priorities among the confusing plethora of contenders for attention in each town, which is so difficult when one is in the middle of the fight. I tried to impart this broader point of view by planting it firmly in the tides of American history. I commented on what are national problems, but through a distinctly local prism. It’s been quite a journey, but the passage of time makes the advantage of perspective a diminishing asset. The sense that it was time to end things has been growing, but always before postponed when events in the Schuylkill Valley allowed me to make a salient point or two. What makes the timing now is most welcome news from a different quarter. McFarland & Company, Inc. has contracted to publish my next book. I am excited about this, and will in the coming months be occupied reading galley proofs, planning promotional events and the like. 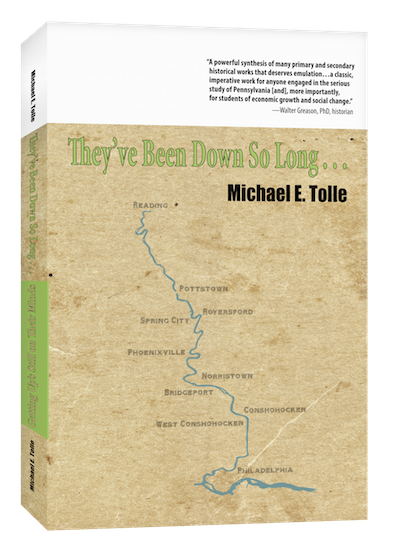 This presents a conflict, because the book has absolutely nothing to do with either the lower Schuylkill River or the towns along it. Thus, my timing has become now. That makes this last post pretty much a “GOOD BYE AND THANK YOU one, and there are many to thank. The Internet tells me that “Ha Det” is “goodbye” in Norwegian, and so I include it in my final post title. I do this to thank the numerous Norwegians who have viewed my blog. I also wish to thank my readers from not just America and Norway, but from Israel, Russia, and many more countries, some of them very far away. I never expected my locally-focused blog to gain an international audience, but it did. It’s humbling to think that I might have contributed a little something toward the better understanding of our confusing country, the United States. But most of all I want to thank my readers in my subject towns along the lower Schuylkill River. I began this blog for you, and although, judging from my page view metrics, you quickly became a small minority of my readers, you remained foremost in my thoughts. And among you, I would most like to thank—believe it or not—those who disagreed with my comments, and weren’t afraid to say so, at least on Facebook. Real change is only possible following an informed exchange of views among those with differing solutions for the problems being faced, and I deeply appreciated your contributions. Want to Preserve Your Own Local History? It’s Up to You! Last month I wrote to you about the Historical Society of Montgomery County, Pennsylvania, and its rebirth of activism and achievement. This month I will ask—nay, plead—with you to be part of this renaissance. The HSMC’s task is to preserve and interpret the history of Montgomery County, Pennsylvania; every corner of its land; every community, and all its many peoples. Or at least it wants to; whether it does it ENTIRELY up to the residents of Montgomery County. And why not, you may ask? The answer is simple, and inescapable: the Historical Society of Montgomery County, Pennsylvania is a volunteer organization when it comes to obtaining the items for its collection. The Society does not buy anything; everything it possesses was gifted to it in some manner. There is also another, related reason. The HSMC demonstrates a characteristic that is by no means unique; I have observed it visiting other local historical societies in other regions of the U.S. Every such historical society was founded at a certain time for a certain reason, and both the time and the reason are apparent in the items displayed by the Society. Decades and even centuries may have passed, but those original historical inspirations remain the core of every society. Subsequent generations cannot sustain the initial enthusiasm. I have, for example, toured a few county historical societies in the West, and if you looked at their displays, you might question whether anything had happened in the area since they ceased driving cattle up the Abilene Trail. The HSMC was founded in the post-Civil War period by people for whom the war was their defining moment, and for whom the Revolutionary war had not been so long ago. The collections reflect that. By comparison, the 20th century has scant representation. That’s a shame, and the residents of Montgomery County, Pennsylvania are the cause. It’s time to change that; in fact, it’s long past time. The 20th century saw the political and social emergence of later immigrants (or their children), those from Italy, Eastern Europe, and of course, Jews. Their descendants should be ensuring that their story is told, because it is just as much the history of Montgomery County as the Revolutionary or Civil Wars. In 1957, three local Councils of the Knights of Columbus established an Assembly to honor Father Joseph C. Tomko, the founding pastor of Mother of Sorrows Church and Catholic School in Bridgeport. Father Tomko died that year and was buried on the church grounds. That Assembly has continued to exist, and in 2017 decided to compile a booklet about Father Tomko in honor of the 60th anniversary of his death. What made the 60th anniversary especially poignant was the fact that the church had been reduced to a pile of rubble, the first step for a housing development. They checked the HSMC, but “the only booklet that did talk about the churches in Bridgeport was the Centennial edition called “History of Bridgeport, Pa 1851-1951” - by Edward Pinkowski and was for sale for the price of one dollar...” That’s a damn shame. But they persevered, collected the stories, and organized them into a booklet. “We ended up with an in-depth historical keepsake of which we printed 175 copies for our Assembly members, contributors and advertisers.” I was given a copy, by the way (thanks, Petrus Korpel); it’s quite impressive. But, most important of all, the Assembly also donated two copies to the HSMC, which, after formal accession procedures, “will be a permanent addition to the Society with historical facts unknown in the past.” That is exactly the point, and I commend the Assembly for this action. The destruction of Mother of Sorrows Church is emblematic of what has been happening all along the lower Schuylkill River. We have all witnessed the decline and closing of so many once-prosperous ethnic parishes in the Schuylkill River towns. These churches, along with the volunteer fire companies, were the core organizations of each town. As their congregants scatter and the churches face the wrecking ball, is their story being told? Will their stories continue to educate future generations, or will they die untold, because no one collected the memories and provided for them? Too many of those stories are going to be lost, because no one took it upon themselves to preserve them. It’s up to you to take action if you want to preserve the history of your people. Do you believe that the history of your parish, your church, or any of your town’s volunteer organizations should be preserved? I encourage you to view the Historical Society of Montgomery County as the agent to accomplish this. It is now staffed by professionals, and your contributions will receive the welcome and the extended care that they deserve. Contact them; they are the professionals, and will assist you, but you have to take the initiative. The town of Norristown, Pennsylvania, has been stagnating for decades. But buried in a residential area of north Norristown is a gem of an organization that itself was stagnating, also for decades, but is clearly on the road to revival and new heights of relevance. Perhaps there are some lessons to be learned here, ones that apply to every town along the lower Schuylkill River. I write about the Historical Society of Montgomery County, Pennsylvania, located at 1654 DeKalb Street in Norristown. I invite those of you from the Conshohockens, Bridgeport, Royersford and Pottstown to read this, because the HSMC is the County Society, not just “the Norristown historical society,” as too many ignorant people have proclaimed. It preserves your history also. The people of Montgomery County need to know more about the HSMC. This month I write about the transformative experience the HSMC has undergone in recent years. It is an example from which many can learn. Next month I’ll write about how you and yours can take advantage of the Society’s new capabilities to write your own community’s history and see that it is preserved. I write this first post from experience; I was a part-time employee of the Society between 1996 and 2001. Those were some of the years of stagnation, and I can testify to that. I don’t know when that period began, but by the time I began there it had been underway for some time, and had settled into a pattern. Genealogy had almost single-handedly sustained the Society, and had become pretty much its sole focus. The late Vivian Taylor and Rose Brown earned the Society high marks for its support of genealogists. But little else got done, and nothing approaching maintenance. The staff knew what the few researchers were looking for, and collected those works in an easy to reach location. They recognized each book by sight, and paid no attention to its actual call number. The mail—largely genealogical queries—was answered, the few visitors serviced (quite well), and the bills were paid, but that was about it. I remember clearly my first day at the Society, when I explored its nooks and crannies. The upper floor of the stacks was an absolute mess; things just piled about, in no order, or in anything close to proper storage. I was appalled to see that there was a window up there (who puts windows in an archival storage room?) that each day spread sunlight across a large pile of old newspapers that were just sitting there. There were pre-Civil war papers, largely anti-slavery in theme. Very valuable items just sat there, gradually fading under sunlight. The last thing I did that first day was to take a piece of cardboard and tape it over the window, to keep out the sunlight. I had to start somewhere. Much of my time at the Society was spent simply moving things around. One of my ongoing efforts (it took a couple of years to accomplish) was to slowly put all the books and pamphlets in their proper call number order, so someone who didn’t know what the book looked like could still find it, just like in a normal library. The core of the Society’s collection is the many old, large, handwritten property records of Montgomery County. They are huge, heavy, and hard to carry. This group of books was divided into three different locations, and were themselves not in chronological order. There was a good reason for that; the HSMC’s shelves were built from what must have been a giant erector set (anyone remember those? ); everything was assembled with bolts and nuts and a wrench. Shelf heights were adjustable, but only with a great deal of effort. I kept working on those shelves, at the cost of a great many skinned knuckles, until they could accept items in their proper order. Finally, one proud day, I could actually proclaim that every book in the collection (save those piled with the old newspapers on the upper floor of the stacks) was now filed in call number order. The Society’s paper and bound items gradually assumed some order, but the massive collection of artifacts lay crammed together in the room that had been designed for meetings. Some had been more or less properly stored, the work of the Society’s dedicated volunteers, but most items just sat on the floor or on temporary shelving. There was barely a path to get through them. I also had to be VERY careful not to touch the silk flag of the 151st Pennsylvania Regiment of Volunteers, which had sat draped around its pole since shortly after the Civil War. One wrong move, and it might have crumbled before my eyes. The reason for all of this was obvious: lack of income. Everyone knew this, so the Society’s Executive Committee threw nickels around like they were manhole covers. Alice Smith, the bedrock of the Society for decades, used to call us “paid volunteers,” and I can testify to the truth of that. Early in my time there I visited the historical societies of both Chester and Bucks Counties, looking for context about the task ahead. I discovered that the Chester County Society’s yearly budget deficit (more spent than collected) alone was greater than the entire year’s budget for the Montgomery County Society. Such a lack of funding meant an even greater reliance on volunteers for an organization that prided itself in its volunteer staff. The entire executive committee and Board of Directors were, of course, unpaid, and put in countless hours trying to keep our head above the water. Our staff of volunteers did most of the work, as is usual in such organizations. In this account of things during the years of stagnation, I must also point to the single most important thing that the Society accomplished during those latter years: obtaining ownership of Montgomery Cemetery. Few today remember how close the cemetery came to becoming part of yet another townhouse development. We fought against that proposal, then managed to secure ownership, thus saving a treasure of Montgomery County history. But when it came to a historical society’s primary task, caring for items made fragile by age, enthusiasm, dedication, and hours invested by volunteers could not compensate for the lack of trained staff to properly catalog, care for, and interpret items in the Society’s collections. The lack of trained staff was due to, of course, lack of money. The end result was a sustained period of stagnation, just getting by. But that was then, and, as I like to say, this is now, and things have changed. I don’t know when the period of stagnation began, but I can date the point at which the inertia of motion replaced the inertia of rest. I’d like to think that I had a small part in it, but the event that made the difference was the election of Ella Aderman as President of the Society. She was, as I understand it, the first Society President to have actually trained in historic preservation. The era of well-meaning amateurs was ending. The path toward today was not smooth; such journeys never are. The Society’s recent past is strewn with departures and hard feelings, but the end result simply cannot be denied. Today, the Historical Society of Montgomery County, Pennsylvania seems to have been reborn. Every member of its staff is a trained professional, for the first time in the Society’s history. Items in the collection are getting the proper treatment, and the meeting room is back in service for community outreach. Genealogy is still important, but the subjects you could learn about from the Society’s speakers and events are quite broad. In March, 2018 alone, you can learn how to maximize your use of Ancestry.com in a class offered by a professional genealogist, or you can attend a workshop about the now-lost art of letter writing, featuring some of the exquisite examples from the HSMC collections, and even try your hand at writing in the old manner. Or, of course, you could do both. The above are just two of the offerings this month; the Society puts on talks and workshops every month. There will be the annual Memorial Day celebration at Montgomery Cemetery, and so much more this year. The Society’s quarterly newsletter the “Acorn,” is a constant source of new information discovered by the Society staff, and shared with members. How did the HSMC accomplish this? I have no idea, but the example it has set should cause some people to talk to them, because new money didn’t resurrect the Society; it was a cooperative effort under an established and adhered-to program. There could be some lessons here. The Historical Society of Montgomery County, Pennsylvania still faces challenges, make no mistake about it. That’s where you county residents can help (even without spending money), and the Society will in turn help you. If you are proud of your town, your township, your church, your ethnicity, or any other local connection, you can help write their history, and see that it is preserved. I’ll write about this opportunity next month. In the meanwhile, stop by and check out the Historical Society of Montgomery County, Pennsylvania. It’s worth the visit. Will the King of Prussia Rail Project Benefit Bridgeport, Norristown, or even King of Prussia? It’s about time I got back to discussing my particular interest, “alternate transportation.” Last month I advocated for the Lafayette Street-to-Turnpike project, as have done previously [5/29/15, 3/11/16, 4/8/16, 1/6/17]. I believe this project to be fundamental to any future renaissance of my favorite town, Norristown, Pennsylvania, and hence I support it. But advocating for roads always leaves me with an underlying discontent. I can repress it because, when the goal is community revitalization, one’s ideology should not color one’s examination of a proposal or project. This month, with greater joy I turn to a currently-under-development-and-may-actually-happen project to build a new rail line in Southeastern Pennsylvania. The “King of Prussia Rail Project” is only a short—less than five miles—east-west spur to the north-south Norristown High Speed Line that will run between King of Prussia and Bridgeport. But it isn’t a local project; it’s part of a regional plan. Its purpose is to establish another connection between King of Prussia and Philadelphia, one not subject to traffic jams. Any benefits accruing to the residents through whose neighborhoods it will pass will be purely coincidental. My headline for this post refers to the towns of Bridgeport and Norristown, but just the residents of King of Prussia; that particular Census Area doesn’t need much help. But it’s going to get help anyway; that’s part of The Project’s reason for being. From my perspective, the King of Prussia Rail Project is yet another demonstration of a historical trend about which I have written before [2/11/14, 2/20/14], the shifting of economic influence from Philadelphia to King of Prussia. The Project’s documents mention how it is designed to connect “Greater Philadelphia’s major centers of commerce and culture.” Two of these three centers—downtown Philadelphia and University City—are already well connected, located just across a river as they are. King of Prussia is the third, and despite what on a map may look like good road connections to the city, anyone who has driven them knows better. While a direct connection between King of Prussia and the downtown/University City area via the existing Regional Rail line would have been preferable, that was apparently dismissed as unfeasible. Hence the connection is indirect, using the long-existing Norristown High Speed line to West Philly for most of the actual mileage itself. Great things are predicted for the project, with most of the benefits seemingly going to King of Prussia. But that hasn’t stopped the opposition from some King of Prussia residents. Local opposition to the project in Upper Merion Township revolves around the usual concerns, i.e., crime, noise pollution, and lowered property values. These are typical NIMBY issues, the type that surface during every proposal for development. But some of the arguments of the local opposition do serve to clarify the real intent behind the grand phrases. Two statements by an opposition leader point out their major issue: "Most of the positives that could come out of this extension would be for people outside Upper Merion Township," and “At best, this train is mainly supported by nonresidents and businesses.” The author is correct on both points, but that’s not going to make any difference. The project is the result of a macro focus on regional transportation; benefits for the King of Prussia residents will be few and far between. The new line will have five stops in Upper Merion, but only one of them will serve the area residents, the one at Henderson Road. The others are destination stops at the favored local business locations. Local opinion seems to have been significant only in the selection of the specific route, particularly in the rejection of the Route 202 route option, which was roundly condemned. Still, you can’t route the line away from everybody, or it really would serve no purpose. Some King of Prussia residents remain concerned about the project’s effect on their properties. My major problem is how Valley Forge Park has become part of the project’s supposed selling points. The train’s final stop westbound is being touted as “a stone’s throw away” from Valley Forge National Park. This is more than a little disingenuous; the final stop is at the Valley Forge Casino. If the Park was a real destination, why not extend the line to the park itself? Still, I guess it sounds better to invoke history than to admit you are actually just making it easier for more people to come from farther away to throw away their money. What the project does seem to offer is better transportation for those that use public transit, i.e., working people, and that is certainly a positive. King of Prussia offers a great many jobs, but is almost inaccessible for anyone without a car. Still, despite all the claims about the huge number of riders that will use the trains (ridership on the High Speed Line is expected to increase by between 61% and 81%), don’t count on traffic in King of Prussia getting any better. The project won’t make an appreciable difference during the already-known bad times of the day (or year). So commerce in the King of Prussia area will definitely benefit, as will some of the people that work there, but what about the eastern end, i.e., Bridgeport? From the perspective of distance, it is difficult to see how the project can be of anything but help to Bridgeport, although how much is uncertain. Once completed, a look at the map would show the Borough at the nexus of a transportation network that connects the Borough to a significant portion of the Delaware valley. Of course, the perspective given to distance simultaneously erases knowledge the details, and it is in the details where the devil resides, is it not? We must also remember that Bridgeport is already connected to the vast majority of this network, and has been for over one hundred years. Clearly, its positive impact has been limited. Will what is only a short extension to the west improve things for Bridgeport, or will it just add more areas to those just travelling through Bridgeport can reach? And here’s a heretical thought for you: could Norristown’s Lafayette Street Project actually be more beneficial to Bridgeport than King of Prussia Rail? Time will tell. As for Norristown, the King of Prussia Rail Project should provide the final piece of evidence about where and what is planned for development. It’s not Main Street, it’s the Lafayette Street/Schuylkill River corridor, with the Regional Transportation Center as its centerpiece. Transit connections—Regional Rail, High Speed Line, King of Prussia Rail, buses and bicycles—are what hopes are based on. They are encouraging more people to pass through, in the hopes that some will like what they see and move nearby. I actually like this approach, but only one thing about the rail project’s effect on Norristown is clear to me at this point. Once the King of Prussia Rail Project is completed, people who live north of the Schuylkill River should no longer drive their cars to King of Prussia in order to do their Christmas shopping there. Drive to the Norristown Transportation Center instead, park your car and take the train. It has two stops at the Mall, and even if your destination store is some distance from either one, is that really longer than you would have to walk if you parked, assuming you could find a parking space at all? Amidst all this vagueness, a word of warning: the King of Prussia Rail Project will ultimately depend on Federal money to finance actual construction. The project, long planned under a more beneficent Federal approach toward rails, was estimated to cost just over $1 billion dollars at this point, and by the time all the required steps are taken, you can expect the total to rise. Whether we ever see anything more than beautiful “artist’s conceptions,” of the King of Prussia Rail Project will depend on the attitude taken by future Federal administrations. That renders its near future rather more questionable, although the recent spate of media articles about the project tend to ignore this point.